The following Internet root beer reviewers have reviewed and/or ranked our Bulldog Root Beer. Please click on the links to read their comments. More reviews will be posted and linked as soon as the reviewers finish their reviews. Anthony's Root Beer Barrel - Anthony ranked Bulldog Root Beer as his top pick with 98 out of 100 points on December 9, 2002. You can rank us too! 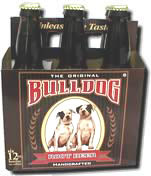 Luke's Root Beer Rankings - Luke ranked Bulldog second from the top with 8.81 out of 10 points on March 16, 2003. Ben's Root Beer Page - Short, simple, and to-the-point reviews. The Root Beer Authority - San Diego deli owner reviews root beers. BevNet - When the Beverage Network called to tell us they had reviewed Bulldog Root Beer, they wanted us to know that they basically never give 5 stars, but they gave 5 stars to Bulldog! You can rank us too. Soda Pop Review - Big site that reviews all kinds of sodas. Great American Root Beer Showdown - Seventeen rounds tasted so far. Jason Mortensen's Root Beer Page - Not a review actually, but kind words about our root beer, none-the-less. Spike's Root Beer Reviews - A humorously caustic look at root beers.